The GoPro is ready, willing, and able to capture your views of the underwater world. Maybe you’re not an accomplished oceanographer, but you still desire to be the Jacques Cousteau of your local swimming hole. Swim with it. Take the GoPro underwater, and mount it to your body with the Chesty body harness or hold it as you navigate the deep. You can use it while snorkeling, scuba diving, or simply taking a dip in a pool (see the figure). Use an extension pole underwater. By attaching the camera to a pole like 3-way or the Handler and submerging it, you can get great underwater footage at a beach, pool, or lake. Mount it underwater. Use an existing mount, or jerry-rig your own; then put it in a pool or a shallow lake. Just be careful that the GoPro doesn’t get swept away and become a hazard to others. That’s why it’s a good idea to use the Floaty Backdoor so the camera can float if it breaks free. Shoot at the surface. Catch a rider on a boogie board, your mom on her raft, or the players in a water-polo match. Attach GoPro to your arm or hand with the Strap to capture with ease. Monitor it with your smartphone. Because most GoPro cameras don’t include a viewfinder, and you don’t want to get your smartphone wet, you can monitor the footage from the sidelines (in other words, away from the water). 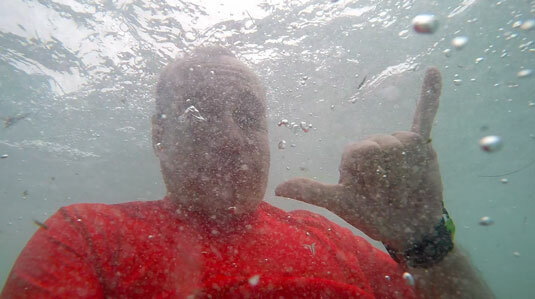 Capturing a selfie under a big wave at La Jolla.